Canberra Raiders chief Don Furner will sit down with the ACT Government to plan a new agreement regarding GIO Stadium. Photo: Supplied. The Canberra Raiders are working towards a new agreement with the ACT Government regarding home games in the ACT as the club looks to find the perfect balance to please both regional and local Green Machine fans. The Raiders will host the Penrith Panthers in Wagga Wagga in the fifth round of the 2019 season after the club signed a two-year deal with the Wagga Wagga City Council to bring NRL matches to the ‘City of Good Sports’. The agreement will see the Raiders send one of their 12 home games to the Riverina during the 2019 and 2020 season, as the club looks to reconnect with its Riverina fan base. The cost of sending a home game outside the ACT border has the potential to hit the back pocket of the club, regardless of the success of crowds due to their current agreement with the ACT Government. The 10-year deal to play home games at GIO Stadium states the club has to pay $150,000 in damages for every home game played away from Canberra Stadium, but it remains to be seen if the fee will be enforced or waived away this season. 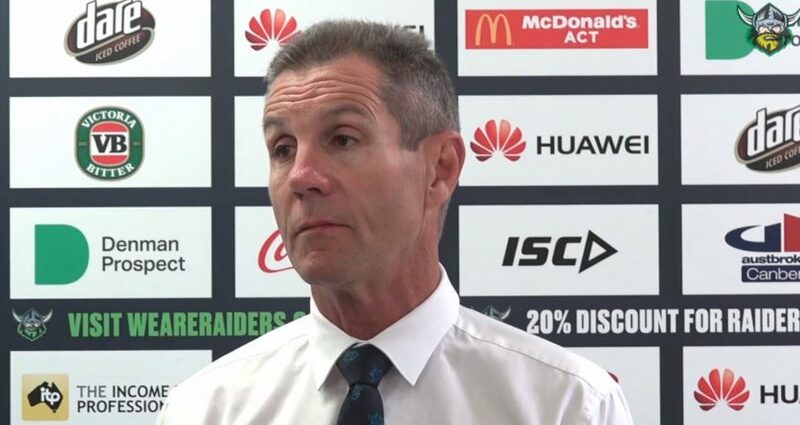 The decade-long deal expires at the end of next season and Raiders’ chief Don Furner said he will sit down with the government to plan a new deal which may remove the clause about playing all 12 matches in the capital. “Our agreement expires at the end of 2019 and currently there is a clause in there and we are talking to the government about that,” Furner said. When asked whether he sees more than one game a season taken to rural areas, Furner said it was a balancing act the club was working on. “It’s always a fine balance. You don’t want to give away the home ground advantage,” he said. “We do have to balance that with the commercial outcome of having a game that maybe makes a loss at the gate. It is possible that we will have fewer games in Canberra but it is not our preferred position. Support from the Riverina helped the Raiders to secure funding for their new $19 million centre of excellence in Braddon, with the club exploring more options to strengthen its reputation as the country region’s team. “We have a Riverina academy going and we have had that for a couple of years, but we have been talking to the NSW rugby league about our under-20s team,” he said. “We have talked about maybe having a joint team run out of the Riverina so that just opens us back out to the country area a bit more and it gives kids a better pathway.